Even if you’ve never seen or read it, you’re most likely familiar with the story of Romeo and Juliet. Shakespeare’s tragic tale of young lovers doomed by a family quarrel is iconic and references to it pervade our culture. What if, by some fortunate happenstance, Romeo and Juliet had not succumbed to their fate so early? What if they had grown old together? This is the premise of Ben Power’s A Tender Thing, currently playing at Soulpepper. Romeo and Juliet has never been one of my favourite Shakespeare plays, but the story is compelling and the language is undeniably persuasive. I’ve studied it in high school, seen seven stage productions and three films, and the same thought has always occurred to me: but you kids have your whole lives ahead of you—gah! If there is one thing that impressed me about this re-working, it is the way it completely eliminates my inclination to so easily dismiss their tragedy. But then… it’s really not the same tragedy. 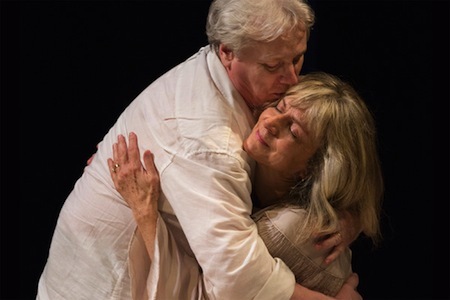 Powers has taken bits of Shakespeare’s text and refashioned them into the tale of an elderly couple facing the challenges of old age and remembering their lives together. Alas, they must die in the end—they are, after all, Romeo and Juliet—but the circumstances are refreshing. Michael Shamata’s production is simple and elegant. We never leave the couple’s bedroom, which is quaint and timeless—a bed, an armchair (with a small stack of books) and a doorway. Even their clothes could have existed at any time. We are given the opportunity to place their story in whichever era seems most relevant to us. Nancy Palk and Joseph Ziegler have an irresistible chemistry, which is not surprising given the fact that they are actually married. Sure, they are remarkable performers in their own right, but their real life intimacy doubtless informs this particular performance. Unfortunately, I didn’t connect to the material quite as intensely as they did. The familiar text in a new context was intriguing, and there are a few poignant moments that stood out, but it all felt a little too polished for my taste. I appreciated the rich and evocative movement. There are several delicately choreographed sequences that are a physical demonstration of their fond memories and current troubles. But… it felt just a little too elegant, too graceful. It is difficult for me to connect to physical and emotional pain, to human frailty, if it is presented with such fluidity and precision. Life’s edges are rougher than that. While watching it, I did wonder if I am perhaps just too young to fully appreciate this tale. I doubt it. There are plenty of stories that deal with growing old that have resonated with me. I really think it’s the style of presentation rather than the material that failed to deliver the feels. A Tender Thing plays at the Young Centre for the Performing Arts (50 Tank House Lane, The Distillery) until Oct 1. Tickets can be purchased at the Young Centre Box Office, online, or by calling the box office at 416-866-8666.